Ghost stories from Massachusetts are as plentiful as they are creepy. Massachusetts is home to Salem, where mass hysteria infested the little town's population and inspired the horrific Salem witch trials. Many innocent men, women, and children lost their lives during this dark time - and that's just one of the many turbulent spans in the state's history. It's no wonder that creepy Massachusetts urban legends and stories tell tales of vengeful spirits. Massachusetts is also the home of the infamous Lizzie Borden, who was accused of hacking her parents to death with an ax. And then there's the Bridgewater Triangle, located in the country’s most haunted forest. With a history like this, it’s no wonder paranormal enthusiasts flock to the state in droves. This list explores some of the ghost stories and shiver-inducing legends that have been chilling and intriguing people for hundreds of years. The old Quaker cemetery in Leicester, MA, is officially called The Friends Cemetery, but to locals it will always be known as Spider Gates. According to legend, it's a gateway to hell; pass through the right (or wrong) entry, and you'll find yourself in the underworld. The chilling stories don't stop there. People say you can summon spirits from their graves, and that a point in the center of the cemetery was used as an altar for Satanic worship. Sometimes, a mysterious white substance oozes from the ground. Human tragedies mark Spider Gate, too; a young girl was supposedly murdered and dismembered in a nearby cave, and a teenage boy may have hanged himself at the cemetery gate back in the 1980s. According to the Quonahassitis tribe, a demon called Hobomock inhabits the granite ledges outside the Boston Light in Cohasset, MA. These rocks are notorious for damaging ship hulls and claiming lives. The lighthouse that was erected to prevent the overwhelming amount of wrecks supposedly has some spirits of its own, all believed to be the ghosts of light keepers past. The first keeper drowned after his boat capsized a few months after he started the job. Robert Saunders, the second keeper, only lasted a few days on the job before he, too, drowned. The Boston Light had been in service a little over a year when the keeper at the time left his two assistants in charge the morning of April 11, 1851. While he was gone, an intense gale moved in from the northeast, preventing him from returning to his post. On April 16th, people were awoken by the non-stop ringing of the fog bell out at the lighthouse. The next morning, the building was gone. One of the unfortunate assistants washed up on Gull Rock Island’s shore; the other was found in Nantucket. Hobomock had struck again. According to local Salem lore, Sheriff George Corwin lived and died on the land Joshua Ward built his house on. Corwin comes out to haunt the house at night, along with two other spirits directly tied to the Salem witch trials. Corwin established his home and jail in Salem in 1680s. During the witch trials, Corwin was nicknamed "The Strangler" for his intense interrogation techniques. People he believed were witches or warlocks received death sentences - if they survived the interrogation, that is. He ordered the executions of 19 men and women, commanding that they be slowly strangled or crushed to death with large rocks. In addition to the sadistic spirit of Corwin, the Joshua Ward House is also supposedly haunted by an executed warlock and witch. They cause the lights to flicker, make doors open and slam, and blow gusts of wind through the house at random. The spirits are also known to overturn trash cans and melt down unlit candles. Most people have heard of Lizzie Borden, thanks to a morbid rhyme: "Lizzie Borden took an ax / and gave her mother forty whacks / when she saw what she had done / she gave her father forty-one." In 1892, Lizzie Borden's father and stepmother were brutally murdered in their home with an ax. Borden was tried for the murders, but acquitted - though she remained notorious for the rest of her life. 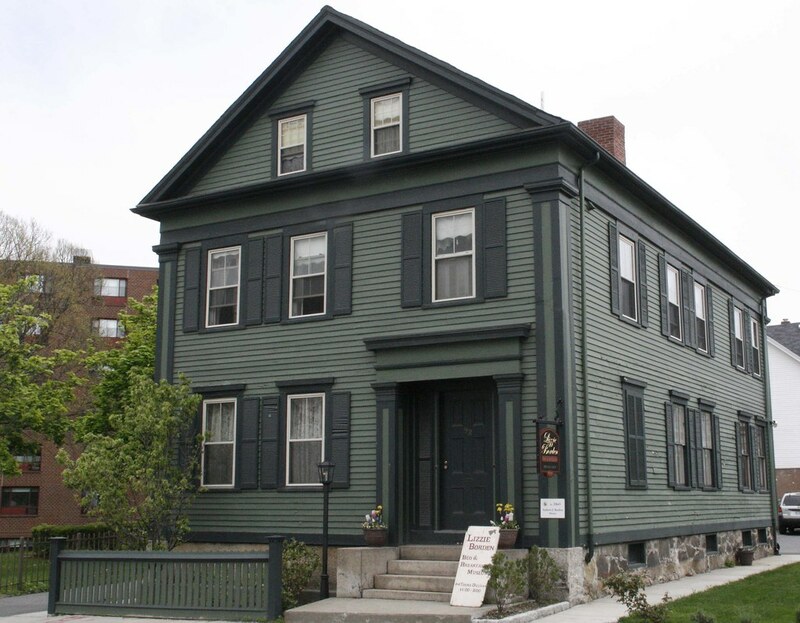 The Borden house still stands in Fall River, MA, and some believe the violent deeds of the past have left their mark on the property. Visitors report feeling ill and having a sense of being watched, and some even claim to have seen apparitions in the home while staying overnight. The house haunting has been investigated by paranormal researchers, and was also featured on the Travel Channel’s Ghost Adventures.